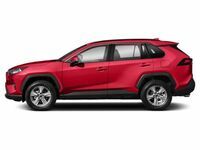 In an ultra-competitive segment, the compact 2018 Toyota RAV4 crossover stands out from the automotive crowd as the quintessential family vehicle. With an athletic style, a spacious cabin, a wealth of next-generation technology features, award-winning safety ratings, an energetic powertrain and an affordable price, the Toyota RAV4 will check all the boxes. 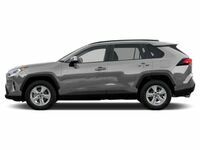 Learn more about the Toyota RAV4 with this in-depth 2018 Toyota RAV4 vs 2018 Honda CR-V comparison at Downeast Toyota. Families who have their hearts set on the 2018 Toyota RAV4 will have a choice of six standard grades – LE, XLE, Adventure, SE, Limited and Platinum – that are complemented by four Toyota RAV4 Hybrid trim levels. With room for five passengers and 38.4 cubic feet of cargo space behind the second-row seats, the Toyota RAV4 is tailor-made for your next adventure. 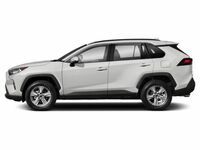 To add to its reputation as a family vehicle, the Toyota RAV4 is an IIHS Top Safety Pick and possesses a five-star NHTSA crash test rating. What Are the Differences Between the Toyota RAV4 and Honda CR-V? Within the compact crossover segment, there are few comparisons that are more intense or closely contested than this 2018 Toyota RAV4 vs 2018 Honda CR-V debate. Toyota RAV4 models start at just $24,510 – a price tag that is in line with the Honda CR-V. What sets the Toyota RAV4 apart from its Honda competitor is an impressive list of standard features, a higher towing capacity provided by the rugged RAV4 Adventure trim, an available hybrid powertrain and a suite of standard Toyota Safety Sense™ collision-prevention systems. Entry-level Toyota RAV4 LE variants feature 17-inch steel wheels, a rearview camera, 60/40 split-folding rear seats and a 6.1-inch Toyota Entune™ infotainment system with one-touch access to Bluetooth and a six-speaker sound system. Toyota Safety Sense™ comes standard and will add a Pre-Collision System with Pedestrian Detection, Lane Departure Alert with Steering Assist, Automatic High Beams and Dynamic Radar Cruise Control. Visit Downeast Toyota today to get behind the wheel of the world-class 2018 Toyota RAV4 in Bangor!